Alice . Syfy. Aired 2009; DVD release 2010. Miniseries review. Watched on Syfy. The Plot: Alice falls through the Looking Glass into Wonderland. Except, it's today's world; Alice is a twentysomething martial arts instructor; and this isn't a children's Wonderland. The Good: I loved this miniseries! It was fun, despite being serious. I liked Alice and her dedication to finding and saving first her boyfriend and then her father. I especially loved the chemistry between Alice and Hatter. Traditionalists won't like this, I'm sure, because it isn't an adaptation of the Lewis Carroll Alice books . Instead, it's a reimagining. The Carroll books were talking about something real. 150 years later, a different Alice travels to Wonderland, a Wonderland 150 years later and much more modern and darker and adult than Carroll's Wonderland. If the earlier Alice was about exploring a strange world, this is about surviving and understanding that world. 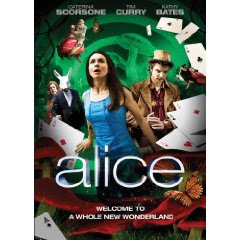 I cannot imagine watching this without having some knowledge of the Alice books (or previous, more literal movie versions). There are many references to the people and things the first Alice encountered, and part of the fun is identifying and figuring that out. So, no, this doesn't work as an introduction to someone with no knowledge of Carroll's original creation. Neither is it for children; Alice is a grown up, those she encounters are grown ups, and it's dark and violent. I watched this on the Syfy channel. At this point, it doesn't look like its available to view online. The DVD is coming out in 2010. I'm curious to see whether there are any extras that aren't available at Syfy.com. We recorded the first part of this and missed the second. I tried watching it and wasn't blown away but your review has convinced me I need to give it another chance. Perhaps I just wasn't in the right frame of mind that day. i really liked this show. i watched both parts! Kimberly, I think it helped watching the miniseries all at once because, well, Hatter. Loved Hatter, but while the "hmmmm interesting" for Hatter was in part one the OMG HATTER didn't really kick up till the second part. Also, the first half was confusing -- i liked the second half because the difference things fell into place and there was less of "What the frack is going on". Michelle, glad to find other people who liked it! Donna, mmmmm, Hatter. I think I'll rent the DVD just to watch him again. I was curious about this one, and I keep hearing good things about it, so I guess I'll have to keep an eye out for the DVD. Thanks for the review!